I'm using the font Basier Square (from here: http://atipofoundry.com/fonts/basier) in Affinity Publisher Beta, but the OpenType superscripts don't work or appear in the typography panel. 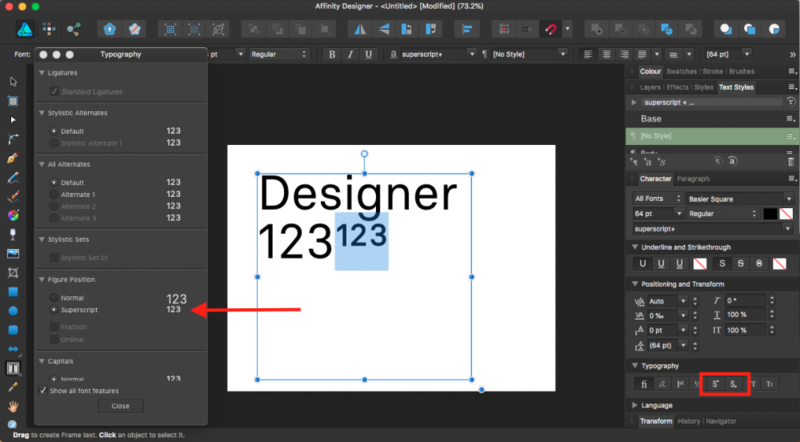 I'm using Affinity Publisher Beta 1.7.0.257 on macOS 10.14.3; the problem also occurred in the previous beta. 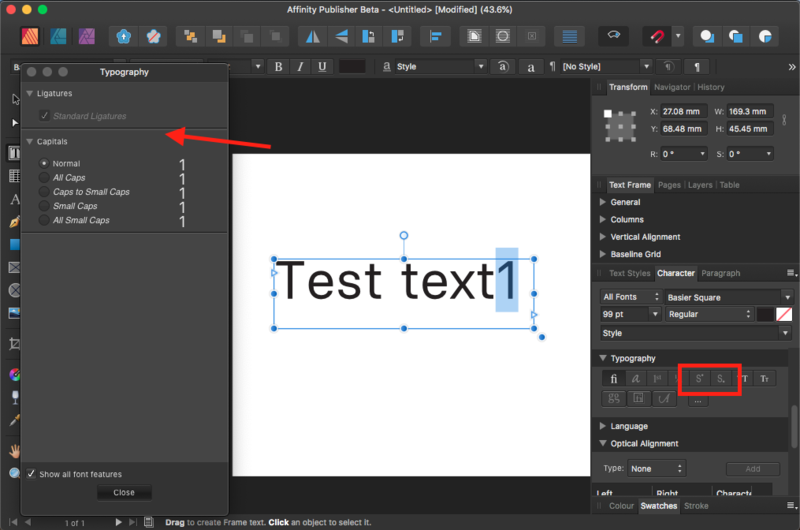 Using the same font in Affinity Designer 1.6.5 gives me the option to use OpenType superscripts and they appear correctly. Can you help me resolve why the two programs are running differently? Serif has changed the font handling in 1.7, and 1.7 will no longer "fake" some typographic features that are not actually supported by the font. One area is in the superscript and subscript area of the Typography section of the Character panel. 1.6 was willing to provide fake super- and/or subscripts for characters not supported by the font. 1.7 isn't. This helps provide a more consistent appearance of the text. When you do this, you will also need to reduce the font size. Between 70% and 75% of normal size should work well for most fonts. At first this appears to be a bug, but it may be an issue with the font. The Basier Square v1.000 that I have has OpenType superscripts for three numbers - 1, 2, and 3. So your example above showing "1" should work. I tested the superscripts in a font editor and they worked as expected. I installed Basier Square - Regular and tested in APub 1.7.0.257. The superscripts do not work. Just as in your screenshot above no Superscript option appears in the Typography panel. But it may be a problem with the font. The stylistic set 01 also did not work. And this is on the same test page where these features are working in some other fonts. Perhaps you can provide a text doc and the fonts for the developers to test. As you've posted in the Publisher Bugs forum one of the QA team or a developer will see the discussion and can provide a private upload link if needed. They're busy, so may not respond immediately. It looks like this is due to this font only specifying its features for the 'Default' script. I've just checked and Publisher is not falling back to use the Default script if features are not specified for the expected or 'Automatic' script determined from the spelling language (for example English -> Latin). 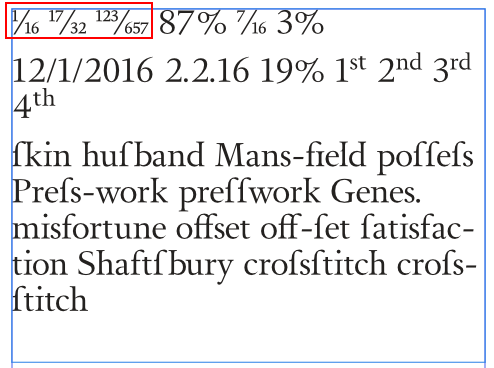 So, I think you've unearthed a bug in Publisher, but the good news is that you can access your OpenType features for the time being by manually switching the Typography Script to 'Default' in the Language section of the Character Panel. Hmmm .... that also enables the missing SS01 alternates. But this may also be an unintended interaction with the enabling/disabling features based on the existence of OpenType features (as Walt mentions above). Why have an OpenType superscripts feature in the font when the only characters supported are the three Unicode legacy characters - onesuperior, twosuperior, and threesuperior? It is my understanding the changes Walt mentions above will disable certain features when the assumed more complete OpenType feature is present. In this case should APub disable the fake superscripts feature for just those limited characters? Why have an OpenType fractions feature in the font when the only characters supported are the three Unicode legacy characters - onehalf, onequarter, and threequarters? Most applications like APub, LibreOffice, etc. are going to replace those using an auto-correct feature. In this case it makes sense to me that APub does not even show Fractions in the Typography panel. I think most users who see an OpenType fractions feature in the Typography panel will expect support for full OpenType arbitrary fractions, and not having that would be confusing. But the stylistic set 01 not being there does confuse me. In this font SS01 is alternate versions of the "a" and "e" characters (and all accented versions). Changing the Typography Script to 'Default' in the Language section of the Character Panel as AdamW recommends above makes the stylistic sets and alternates, etc. then appear in the Typography panel. Is that a font issue? Or an APub issue? Or both? So there appear to quite be a few interacting issues, and possible bugs, and odd font problems/issues. I don't think it should. The statement from Serif (as I understand it) was that Publisher was no longer going to "fake" unsupported characters when the typographic options were being used, as 1.6 did. The reason given was for consistency of appearance. For example, suppose in a font that 1, 2, and 3 have typographic superscript support, but 4-0 don't. If you had a string with superscript 12345, where the 123 came from the font's typographic feature and the 45 was faked, the 45 could look very different from the 123. What you, as a user, should do in that case is choose the "fake" support (Positioning and Transforms, superscript) for that string, rather than the Typographic support. That way you get a consistent appearance for the entire superscript string. And you wouldn't be able to do that if Publisher disabled the ability to do its manual transformation for 123. I was thinking that it was an all or none decision. That basically says we don't mix the two (real and fake) as you mention. And that both ways are available. So this does now have me wondering why the OpenType superscripts are not available in Typography. Appears to be a font issue as Adam mentions. Anybody from APub want the font for testing? ... Why have an OpenType fractions feature in the font when the only characters supported are the three Unicode legacy characters - onehalf, onequarter, and threequarters? So that fonts that are not limited by a legacy frac feature can just turn fractions on...same thing as regards ordinals. That font is limited to just the "legacy frac feature" - it has no OpenType feature code for anything else. The only fractions it can produce are the three listed. There is no support for anything else such as the expected OpenType arbitrary fractions. and in my opinion just stupid. Imagine a user buying an OpenType font which lists "frac" as a feature - and then you find-out it is nothing more than three ligatures replaced by the three legacy fractions. Every antiquated word processor can already produce those few fractions. I certainly missed your point. Especially the early font conversions from TTF fonts to OTF, there was no real work done other than the conversion. The limited range of numerals that are superscript are a hold over from PS fonts from which the TTFs were made and so made it into the OTFs as well. And it is a rip-off. Even a lot of newly made fonts do the same dumb thing over and over. They may be able to cover 90% of the World's languages (which is itself a good thing) but often fail with both fractions and ordinals. Even those that have a broader range of pre-built fractions, while better in that regards, should still build arbitrary fractions. Thanks for the discussion. We have the font. I've logged a bug report for the original issue as I understand it, and I've also logged a feature request for user defined sub / superscript position and scaling.